A Ahmed, Z Simmons. Drugs Which May Exacerbate or Induce Myasthenia Gravis: A Clinician's Guide. The Internet Journal of Neurology. 2008 Volume 10 Number 2. When a patient develops an exacerbation of myasthenia gravis, the treating physician searches for possible causes. One such cause is the prescription of one or more medications which may worsen neuromuscular transmission. Clinicians should be aware not only of the specific medications which may produce such exacerbations, but also of the probability of exacerbations with specific medications, so that they can balance the potential for good and the potential for harm in order to arrive at a reasonable therapeutic plan. An awareness of medications which may trigger myasthenia gravis in patients with no history of this disorder is important as well, particularly for neurologists who are asked to evaluate such patients. For those patients with myasthenia gravis undergoing anesthesia, anesthesiologists should be aware of anesthetic agents which warrant special attention. Myasthenia gravis is an immune-mediated post-synaptic disorder of neuromuscular transmission, most commonly presenting as oculobulbar and proximal muscle weakness associated with easy fatigability. Because a variety of pharmacologic agents may affect neuromuscular transmission, physicians caring for these patients often must determine whether the medications needed by these patients are likely to adversely affect their myasthenia gravis. This is a particularly important question when such medications are being prescribed for potentially life-threatening conditions such as cardiac arrhythmias, or when anesthetic agents must be chosen for life-saving surgery. In addition, many patients with myasthenia gravis are treated with immunosuppressive agents, leading to more frequent and serious infections than are seen in the general population, and requiring judicious choices of antibiotics. The purpose of this review is to provide a clinician's guide to medications which may exacerbate myasthenia gravis, or which may produce signs and symptoms of myasthenia gravis in patients without a known defect of neuromuscular transmission. We also call attention to special considerations regarding the use of anesthetic agents in these patients. This is not intended as a comprehensive review of pharmacologic mechanisms, but rather as a practical, concise summary of drugs which should be of use to specialists and generalists alike. The mechanism by which calcium channel blockers affect neuromuscular transmission is not well established. They are believed to act at both the presynaptic and postsynaptic levels via blockade of L-type calcium channels. 1,2 Verapamil also prevents potassium outflow at the motor end plate and causes a decrease in intracellular ionized calcium levels. 3 In patients without known defects of neuromuscular transmission, the calcium channel blockers felodipine and nifedipine have been found to produce features of myasthenia gravis including dysphagia, ptosis, and generalized weakness after long-term use ranging from 18 months to 12 years. These patients were seronegative for acetylcholine receptor antibodies but demonstrated decremental responses on repetitive nerve stimulation. Discontinuing these drugs resulted in resolution of their symptoms, which re-appeared after the medications were reintroduced. 1 Similarly, oral use of verapamil and amlodipine for at least 3 months in patients with no prior known neuromuscular junction defects has resulted in abnormal jitter on single-fiber EMG study. 2 In patients with known myasthenia gravis, nifedipine caused worsening of symptoms. 4 In contrast, short term use of verapamil did not worsen the decrement seen on repetitive nerve stimulation when given to patients with myasthenia gravis as a single injection or when given orally for 14 days. 5,6 Thus, although not absolutely contraindicated, calcium channel blockers should be used with caution in patients with myasthenia gravis. Short term use appears to be less risky than long term use. Case reports describe a number of beta blockers , including propranolol, practolol, oxprenolol, atenolol, sotalol, nadolol, and ophthalmic timolol which appear to have produced symptoms and signs of myasthenia gravis in patients with no known defects of neuromuscular transmission, or to have exacerbated myasthenic symptoms in patients with known myasthenia gravis. 7,8,9,10,11 Findings have included ptosis, diplopia, and decremental responses on repetitive stimulation studies. The mechanism may be at the level of the neuromuscular junction or the muscle membrane. 7,8 Recovery has followed discontinuation of these medications. 7,8,10,11 Doses have varied widely, and no clear dose-response relationships with severity of symptoms of myasthenia gravis have been established. As with calcium channel blockers, short term use of propranolol intravenously as a single dose, or orally for 14 days has not been found to worsen the decremental response on repetitive stimulation in patients with known myasthenia gravis. 5,6 We believe that chronic use of beta blockers must be undertaken with great caution in patients with myasthenia gravis, whereas short-term use appears to be less risky. Anti-arrhythmic agents including procainamide, etafenone, peruvoside, and propafenone have been reported to both induce and exacerbate myasthenia gravis. Descriptions consist primarily of case reports 12,13,14,15 . Procainamide is believed to act both pre-synaptically and post-synaptically, 12,13,16 decreasing the release of. acetylcholine 12 and reducing the susceptibility of the muscle membrane to action potentials. 12,13 Propafenone and procainamide appear to act as sodium influx blockers. 12,15 Myasthenic symptoms were seen with acute and chronic use; the duration of treatment ranging from a few hours to 8 months before development of symptoms. Drug levels and dosages varied, as with beta blockers. Caution and close observation are needed if these medications must be used for short-term or long-term therapy in patients with myasthenia gravis. Quinine, quinidine, and chloroquine affect neuromuscular transmission both presynaptically and post synaptically. 17,18 At the presynaptic level there is a reduction of acetylcholine release due to blockade of voltage dependent sodium channels, 18 and postsynaptically there is potentiation of depolarization. 17 Some patients with no evidence of a pre-existing neuromuscular junction disorder developed ptosis, diplopia, dysarthria, dysphagia, and generalized weakness while taking chloroquine. 19,20,21 Single-fiber EMG study or repetitive stimulation studies were abnormal. Clinical and electrodiagnostic abnormalities resolved with discontinuation of the medication. Some reports have found that acetylcholine receptor antibodies were absent in such patients. 17,19,21 Others have noted these and other antibodies such as anti-DNA and anti nuclear antibodies to be present, but to disappear after discontinuation of these medications. 20 Thus, quinolone derivatives, like many of the medications discussed here, must be used with caution in patients with known myasthenia gravis. In addition, the treating physician should be alert to the possibility of the development of symptoms of myasthenia gravis in patients treated with these medications who have no known history of this condition. Penicillamine is used for treatment of a variety of autoimmune disorders, and may be associated with the development of myasthenic symptoms including diplopia, dysarthria, and ptosis, in association with elevated titers of acetylcholine receptor antibodies. 22 Multiple mechanisms are thought to contribute to development of myasthenia. Some of these patients may have autoimmune-mediated subclinical defects of neuromuscular transmission which are unmasked by penicillamine. 3,23,24,25,26 Another potential mechanism is a direct immunomodulating effect of the drug by binding to the acetylcholine receptors with resultant production of antibodies directed against the receptors. 27 Prostaglandin E1 induced muscle weakness has also been postulated. 28 Generally complete resolution of these symptoms and disappearance of acetylcholine receptor antibodies occurs with discontinuation of the penicillamine. 27,29,30,31 Most reports of penicillamine-associated myasthenia gravis involve long term therapy, typically 2 months to 2 years. 27,30 Penicillamine can be used with caution and close monitoring in patients with myasthenia gravis. Animal studies report neuromuscular transmission abnormalities with H-2 receptor blockers such as cimetidine, ranitidine, and roxatidine. 41,42,43 Postulated mechanisms include pre-synaptic and post-synaptic interactions 43 and inhibition of acetylcholinesterase, 43 however there are no convincing reports of induction or exacerbation of myasthenia gravis in humans. Caution should be exercised when using these agents in individuals with myasthenia gravis, but they are not contra-indicated. A few cases of worsening of myasthenic symptoms have been observed with the use of ampicillin 53 and other penicillins. Bacitracin may also worsen myasthenia, but the literature is confounded by the concomitant use of other antibiotics. 47 Polymyxins are considered to act both pre-and post-synaptically to produce or exacerbate myasthenia gravis. 25 Their action is reversed by the administration of diaminopyridine only. 47 Tetracycline and its analogues are reported to have weak neuromuscular blocking effects which usually are reversed by calcium, 47 and are thought to exacerbate myasthenia gravis. 23,25 There have been reports of worsening of myasthenia with the use of imipenem/cilastatin, 54 and with infusion of vancomycin. 55 The mechanism of action of these at the neuromuscular junction is not known. We recommend avoiding the use of aminoglycosides in patients with known neuromuscular transmission defects. The other antibiotics discussed above should be used with caution in these patients. Case reports and animal studies report unmasking and induction of myasthenic symptoms with the use of phenytoin, carbamazepine, trimethadione and gabapentin. 56,57,58,59 A variety of mechanisms have been identified. Long term phenytoin use may cause a depressed postsynaptic response to acetylcholine, inhibition at the level of calcium channels, and (at high concentration) an increase in the threshold of the muscle membrane. 60 Carbamazepine and trimethadione are thought to trigger an immune response with development of myasthenic symptoms. 58,61,62,63 Unmasking of myasthenia gravis is seen with the use of gabapentin, which is thought to bind to voltage gated calcium channels. 59 Remission is generally seen after withdrawal of these drugs. While none of these medications commonly unmask or induce myasthenia gravis, physicians should be aware of the possibility. The chemotherapeutic agents doxorubicin, etoposide, and cisplatin have been reported to exacerbate myasthenia gravis. 64,65 Respiratory and bulbar dysfunction have been noted within 24 hours of receiving these agents in combination, but cisplatin alone has been associated with respiratory worsening. The mechanism at the neuromuscular junction is unknown. Lithium use can induce and unmask myasthenic symptoms. The mechanism is thought to be a decrease in the synthesis of acetylcholine and increased breakdown of acetylcholine receptors. 56,72 Lithium can also prolong neuromuscular blockade caused by neuromuscular blocking anesthetics. 25,44 Neuroleptics such as chlorpromazine and haloperidol, and tricyclic antidepressants such as amitriptyline and imipramine, are considered to have an adverse effect on neuromuscular transmission. 23,73 Caution should be exercised with the use of these psychotropic medications in myasthenic patients. Local anesthetics such as lidocaine, procaine, bupivacaine and esther anesthetics are thought to potentiate the effects of neuromuscular blocking agents. 25,75 However, the use of reduced dosages in myasthenic patients can decrease the chance of complications. Many medications have been implicated as possibly worsening myasthenia gravis or inducing symptoms of myasthenia gravis in asymptomatic individuals. These are summarized in Table 1. Most of the data is in the form of case reports or very small series, making firm recommendations challenging. With the likely exception of aminoglycoside antibiotics, most other agents discussed in this review can be used in patients with myasthenia gravis if medically indicated, but should be employed with caution and close monitoring. 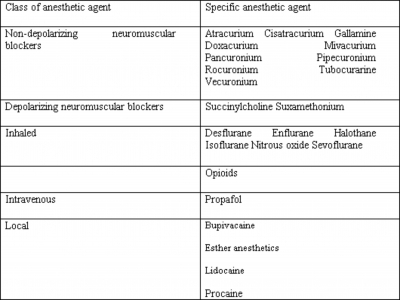 In addition, anesthetic agents must be used with caution in these patients (Table 2). An awareness of the potential for exacerbating or inducing symptoms of myasthenia gravis should permit clinicians to engage in safer treatment of medical and surgical problems in these patients. 1. Pina Latorre MA, Cobeta JC, Rodilla F, et al. Influence of calcium antagonist drugs in myasthenia gravis in the elderly. J Clin Pharm Ther 1998;23:399-401. 2. Ozkul Y. Influence of calcium channel blocker drugs in neuromuscular transmission. Clin Neurophysiol 2007;118:2005-2008. 3. Wittbrodt ET. Drugs and myasthenia gravis. An update. Arch Intern Med 1997;157:399-408. 4. Rajasekaran D, Chandrasekar S, Rajendran M. Drug related crisis in myasthenia gravis. J Assoc Physicians India 2006;54:820-821. 5. Matell G, Bjelak S, Jonkers I, et al. Calcium channel and beta-receptor antagonists and agonists in MG. Ann N Y Acad Sci 1998;841:785-788. 6. Jonkers I, Swerup C, Pirskanen R, et al. Acute effects of intravenous injection of beta-adrenoreceptor-and calcium channel at antagonists and agonists in myasthenia gravis. Muscle Nerve 1996;19:959-965. 7. Herishanu Y, Rosenberg P. Letter: Beta-blockers and myasthenia gravis. Ann Intern Med 1975;83:834-835. 8. Weber JC. Beta-adrenoreceptor antagonists and diplopia. Lancet 1982;2(8302):826-827. 9. Choi KL, Wat MS, Kung AW, et al. Phaeochromocytoma associated with myasthenia gravis precipitated by propranolol treatment. Aust N Z J Med 1995;25:257. 10. Hughes RO, Zacharias FJ. Letter: Myasthenic syndrome during treatment with practolol. Br Med J 1976;1(6007):460-461. 11. Shaivitz SA. Timolol and myasthenia gravis. JAMA 1979;242:1611-1612. 12. Miller CD, Oleshansky MA, Gibson KF, et al. Procainamide-induced myasthenia-like weakness and dysphagia. Ther Drug Monit 1993;15:251-254. 13. Godley PJ, Morton TA, Karboski JA, et al. Procainamide-induced myasthenic crisis. Ther Drug Monit 1990;12:411-414. 14. Niakan E, Bertorini TE, Acchiardo SR, et al. Procainamide-induced myasthenia-like weakness in a patient with peripheral neuropathy. Arch Neurol 1981;38:378 379. 15. Lecky BR, Weir D, Chong E. Exacerbation of myasthenia by propafenone. J Neurol Neurosurg Psychiatry 1991;54:377. 16. Fierro B, Castiglione MG, Salemi G, et al. Myasthenia-like syndrome induced by cardiovascular agents. Report of a case. Ital J Neurol Sci 1987;8:167-169. 17. Robberecht W, Bednarik J, Bourgeois P, et al. Myasthenic syndrome caused by direct effect of chloroquine on neuromuscular junction. Arch Neurol 1989;46:464-468. Sieb JP, Milone M, Engel AG. Effects of the quinoline derivatives quinine, quinidine, and chloroquine on neuromuscular transmission. Brain Res 1996;712:179-189. 18. Klimek A. The myasthenic syndrome after chloroquine. Neurol Neurochir Pol 1999;33:951-954. 19. Sghirlanzoni A, Mantegazza R, Mora M, et al. Chloroquine myopathy and myasthenia-like syndrome. Muscle Nerve 1988;11:114-119. 20. Bruggemann W, Herath H, Ferbert A. Follow-up and immunologic findings in drug-induced myasthenia. Med Klin 1996;91:268-271. 21. Penn AS, Low BW, Jaffe IA, et al. Drug-induced autoimmune myasthenia gravis. Ann N Y Acad Sci 1998;841:433-449. 22. Adams SL, Mathews J, Grammer LC. Drugs that may exacerbate myasthenia gravis. Ann Emerg Med 1984;13:532-538. 23. Jan V, Callens A, Machet L, et al. D-penicillamine-induced pemphigus, polymyositis and myasthenia. Ann Dermatol Venereol 1999;126:153-156. 24. Howard JF Jr. Adverse drug effects on neuromuscular transmission. Semin Neurol 1990;10:89-102. -- a. 26. Komal Kumar RN, Patil SA, Taly AB, et al. Effect of d-penicillamine on neuromuscular junction in patients with Wilson disease. Neurolog.2004;63:935 -- b. 936. 25. Drosos AA, Christou L, Galanopoulou V, et al. D-penicillamine induced myasthenia gravis: clinical, serological and genetic findings. Clin Exp Rheumatol 1993;11:387-391. 26. Horrobin DF. Myasthenia and prostaglandin E1. Ann Intern Med 1979;90:719. 27. Kuncl RW, Pestronk A, Drachman DB, et al. The pathophysiology of penicillamine-induced myasthenia gravis. Ann Neurol 1986;20:740-744. 28. Raynauld JP, Lee YS, Kornfeld P, et al. Unilateral ptosis as an initial manifestation of D-penicillamine induced myasthenia gravis. J Rheumatol 1993;20:1592-1593. 29. Adelman HM, Winters PR, Mahan CS, et al. D-penicillamine-induced myasthenia gravis: diagnosis obscured by coexisting chronic obstructive pulmonary disease. Am J Med Sci 1995;309:191-193. 30. Abramsky O, Aharonov A, Teitelbaum D, et al. Myasthenia gravis and acetylcholine receptor. Effect of steroids in clinical course and cellular immune response to acetylcholine receptor. Arch Neurol 1975;32:684-687. 31. Vallet B, Fourrier F, Hurtevent JF, et al. Myasthenia gravis and steroid-induced myopathy of the respiratory muscles. Intensive Care Med 1992;18:424-426. 32. Bae JS, Go SM, Kim BJ. Clinical predictors of steroid-induced exacerbation in myasthenia gravis. Journal of Clinical Neuroscience 2006;13:1006-1010. 33. Patten BM, Oliver KL, Engel WK. Adverse interaction between corticosteroid hormones and anticholinesterase drugs. Trans Am Neurol Assoc 1973;98:248-252. 34. Brunner NG, Namba T, Grob D. Corticosteroids in management of severe, generalized myasthenia gravis. Effectiveness and comparison with corticotropin therapy. Neurology 1972;22:603-610. 35. Jenkins RB. Treatment of myasthenia gravis with prednisone. Lancet 1972;1(7754):765-767. 36. Karcic AA. Drugs that can worsen myasthenia gravis.[comment]. Postgrad Med 2000;108:25. 37. Miller RG, Milner-Brown HS, Mirka A. Prednisone-induced worsening of neuromuscular function in myasthenia gravis. Neurolog 1986;36:729-732. 38. Panegyres PK, Squier M, Mills KR, et al. Acute myopathy associated with large parenteral dose of corticosteroid in myasthenia gravis. J Neurol Neurosurg Psychiatry 1993;56:702-704. 39. Bossa R, Chiericozzi M, Galatulas I, et al. The effects of roxatidine on neuromuscular transmission. In Vivo 1995;9:113-115. 40. Bossa R, Chiericozzi M, Efstathiu G, et al. The effect of H2 receptor antagonists on neuromuscular transmission. In Vivo 1991;5:57-59. -- a. 43. Re L, Di Sarra B. Effects of famotidine at the mouse neuromuscular junction compared with those of cimetidine and ranitidine. Pharmacology 1989;39:200 -- b. 204. 41. Barrons RW. Drug-induced neuromuscular blockade and myasthenia gravis. Pharmacotherapy 1997;17:1220-1232. 42. McQuillen MP. Hazard from antibiotics in myasthenia gravis. Ann Intern Med 1970;73:487-488. 43. Fiekers JF. Effects of the aminoglycoside antibiotics, streptomycin and neomycin, on neuromuscular transmission. II. Postsynaptic considerations. J Pharmacol Exp Ther 1983;225:496-502. 44. Sokoll MD, Gergis SD. 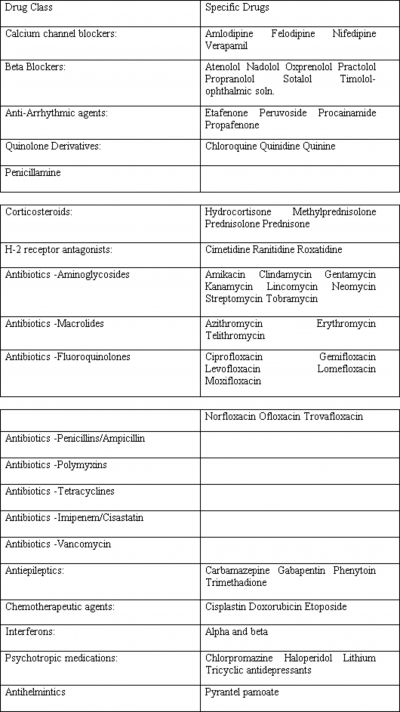 Antibiotics and neuromuscular function. Anesthesiology 1981;55:148-159. 45. May EF, Calvert PC. Aggravation of myasthenia gravis by erythromycin. Ann Neurol 1990;28:577-579. 46. Perrot X, Bernard N, Vial C, et al. Myasthenia gravis exacerbation or unmasking associated with telithromycin treatment. Neurology 2006;67:2256-2258. 47. Jennett AM, Bali D, Jasti P, et al. Telithromycin and myasthenic crisis.[comment]. Clin Infect Dis 2006;43:1621-1622. 48. Cadisch R, Streit E, Hartmann K. [Exacerbation of pseudoparalytic myasthenia gravis following azithromycin (Zithromax)]. Schweizerische Medizinische Wochenschrift Journal Suisse de Medecine 1996;126:308-310. 49. Gunduz A, Turedi S, Kalkan A, et al. Levofloxacin induced myasthenia crisis. Emerg Med J 2006;23:662. 50. Argov Z, Brenner T, Abramsky O. Ampicillin may aggravate clinical and experimental myasthenia gravis. Arch Neurol 1986;43:255-256. 51. O'Riordan J, Javed M, Doherty C, et al. Worsening of myasthenia gravis on treatment with imipenem/cilastatin. J Neurol Neurosurg Psychiatry 1994;57:383. 52. Huang KC, Heise A, Shrader AK, et al. Vancomycin enhances the neuromuscular blockade of vecuronium. Anesth Analg 1990;71:194-196. 53. Kaeser HE. Drug-induced myasthenic syndromes. Acta Neurol Scand Suppl 1984;100:39-47. 54. Ozawa T, Nakajima T, Furui E, et al. A case of myasthenia gravis associated with long-term phenytoin therapy. Rinsho Shinkeigaku 1996;36:1262-1264. 55. Booker HE, Chun RW, Sanguino M. Myasthenia gravis syndrome associated with trimethadione. JAMA 1970;212:2262-2263. 56. Boneva N, Brenner T, Argov Z. Gabapentin may be hazardous in myasthenia gravis. Muscle Nerve 2000;23:1204-1208. 57. So EL, Penry JK. Adverse effects of phenytoin on peripheral nerves and neuromuscular junction: a review. Epilepsia 1981;22:467-473. 58. Kurian MA, King MD. Antibody positive myasthenia gravis following treatment with carbamazepine--a chance association? Neuropediatrics 2003;34:276-277. 59. Rasmussen M. Carbamazepine and myasthenia gravis. Neuropediatrics 2004;35:259. 60. Peterson H. Association of trimethadione therapy and myasthenia gravis. N Engl J Med 1966;274:506-507. 61. Solak Y, Dikbas O, Altundag K, et al. Myasthenic crisis following cisplatin chemotherapy in a patient with malignant thymoma. J Exp Clin Cancer Res 2004;23:343-344. 62. Ng CV. Myasthenia gravis and a rare complication of chemotherapy. Med J Aust 2005;182:120. 63. Weegink CJ, Chamuleau RA, Reesink HW, et al. Development of myasthenia gravis during treatment of chronic hepatitis C with interferon-alpha and ribavirin. J Gastroenterol 2001;36:723-724. 64. Blake G, Murphy S. Onset of myasthenia gravis in a patient with multiple sclerosis during interferon-1b treatment. Neurology 1997;49:1747-1748. 65. Dionisiotis J, Zoukos Y, Thomaides T. Development of myasthenia gravis in two patients with multiple sclerosis following interferon beta treatment. J Neurol Neurosurg Psychiatry 2004;75:1079. 66. Harada H, Tamaoka A, Kohno Y, et al. Exacerbation of myasthenia gravis in a patient after interferon-beta treatment for chronic active hepatitis C. J Neurol Sci 1999;165:182-183. 67. Borgia G, Reynaud L, Gentile I, et al. Myasthenia gravis during low-dose IFN-alpha therapy for chronic hepatitis C. J Interferon Cytokine Res 2001;21:469-470. 68. Shimizu H, Kataoka H, Kawahara M, et al. Interferon causes no myasthenia in a seropositive patient with multiple sclerosis. Clin Neurol Neurosurg 2007;109:277-278. 69. Alevizos B, Gatzonis S, Anagnostara C. Myasthenia gravis disclosed by lithium carbonate. J Neuropsychiatry Clin Neurosci 2006;18:427-429. 70. Argov Z, Mastaglia FL. Drug therapy: Disorders of neuromuscular transmission caused by drugs. N Engl J Med 1979;301:409-413. 71. Bescansa E, Nicolas M, Aguado C, et al. Myasthenia gravis aggravated by pyrantel pamoate. J Neurol Neurosurg Psychiatry 1991;54:563. 72. Abel M, Eisenkraft JB. Anesthetic implications of myasthenia gravis. Mt Sinai J Med 2002;69:31-37. 73. Baraka A. Onset of neuromuscular block in myasthenic patients. Br J Anaesth 1992;69:227-228. 74. Levitan R. Safety of succinylcholine in myasthenia gravis. Ann Emerg Med 2005;45:225-226. 75. Baraka A. Anesthesia and critical care of thymectomy for myasthenia gravis. Chest Surg Clin N Am 2001;11:337-361. 76. Della Rocca G, Coccia C, Diana L, et al. Propofol or sevoflurane anesthesia without muscle relaxants allow the early extubation of myasthenic patients. Can J Anaesth 2003;50:547-552.